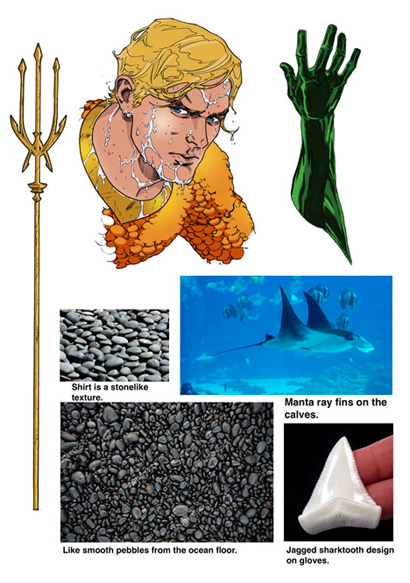 The Aquaman Shrine: Do you come to Aquaman with any particular fandom for the character? Did you read Aquaman comics before this? TAS: If so, are there any particular Aquaman artists you look to for inspiration? BW: A little bit, but I try not to look too directly at previous artists or contemporaries while I draw, because I don't want to have a run that feels rehashed, visually. Before getting started, when I was sketching the character, I poured over as much of the old Nick Cardy stuff as I could, cause it's so beautiful and distinctive. I love the Jarvinen and Jim Califiore era, but it didn't play into our version too much, visually. He's had a lot of really strong art in recent years, from Pat Gleason, to Butch Guice, to Steve Epting, to Ivan Reis. Those are some big names considering he's a character people feel is under appreciated. And that's not even mentioning the strong list of writers. TAS: You mention Nick Cardy, who of course was a genius artist and did amazing work on Aquaman. Any particular images of his (covers or otherwise) that you would point to as particularly inspiring (or just a favorite)? BW: His whole run of covers was pretty epic. I don't have much of his run, just a couple of the black and white Showcase editions. A lot of his stuff isn't available, sadly. But if you google his cover work from Aquaman and Teen Titans, it's some of the most exciting covers you've ever seen. And exactly the kind of covers I love, in the sense that, you look at them, and they make you curious to know what's happening, and open an issue and read them. Hard to say which of them is the best, but Aquaman #s 40, 42, and 45 jump out at me, as well as Teen Titans 14 and 16. 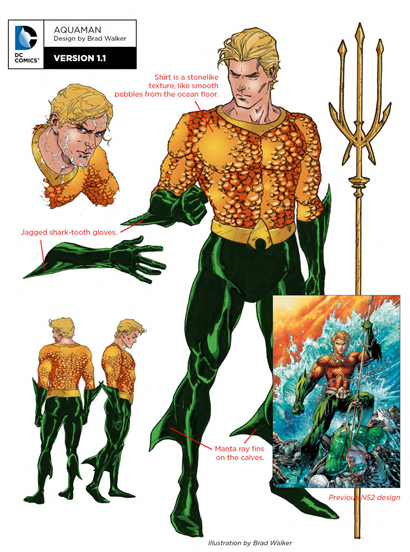 TAS: You’ve gotten a chance to redesign the characters and the world that populates AQUAMAN. Was there a definitive "THIS is the character" look that you used as a starting point, a sort of platonic ideal? BW: Well, at first, we weren't sure if we were going to have to lean into a Jason Momoa look. I wanted to go very classic, but I also like the hook-hand era (which the Momoa look reminds me of), so it wouldn't have broken my heart to have to do that, either. I did a round of designs that I thought met in the middle between classic and movie, but ultimately, we got the okay to just go more classic comic, like the editors and I really wanted, anyway. I wanted it to be bright, and open, and positive, in keeping with the thrust of Rebirth, which was why I looked at Nick Cardy stuff. Obviously, we differed to a lot of what Ivan did, because this is directly coming from that era. But we also didn't want it to feel derivative, so I tried to change little things, or create the illusion of change. The texture of the shirt got a lot of attention, but I didn't even see it as such a big deal. I thought it was more of an approach than a redesign. The idea that they were big, orange fish scales was always confusing to me, as a kid. I thought he liked fish. Why was he wearing the hide of one? Haha! So, I thought of a way to change the texture that would keep the general pattern. Editorial always responds to the idea of armor and functionality, and I like the idea of applying internal logic from the environments, with a character like this. I figured it could be reasoned that it was an Atlantean armor texture, like stones from the ocean floor, smoothed from the current. I didn't even think of it as a costume change, as much as just the way I was interpreting it, in the same way Todd McFarlane drew Spider-Man's eye a little larger, or more webs on the costume, though it was still the same costume. So, I was surprised that it garnered so much response, when they showed it. Beyond that, I tried to apply similar internal logic to the different elements and textures that wouldn't change things too much, but would keep the thinking consistent, and satisfy the portion of the audience that expects new designs for any new initiative, like this. I liked the idea of having fins like a manta ray on his legs, rather than the triangle style fins he used to have. They show some visual movement when you pose him and when he swims, which is useful. Editorial wanted some sort of gauntlet, but something less clunky than the most recent version. So, I looked at other elements of sea life their culture might've appropriated style from and thought a jagged shark tooth design was interesting. It's still in the shape of his classic gloves, and looks the same in silhouette, but it's a slight visual difference, and it's useful, in a fight. Similarly, with Mera, I decided, if I was drawing the scales as a more rock-like texture, that could look odd, stretched over her entire body. Not to mention, she had recently been wearing her Aquaman-derived Aquawoman costume. So, supporting Aquaman's costume is designed for battle, I figured that her green outfit is less battle wear, and more the queen's garb. I looked at her classic design (she's only moved to the scales in recent years. I think she had that squiggle texture as recently as the Pat Gleason era). I felt fairly certain that the squiggly line was always meant to represent seaweed and if you google 'seaweed', you'll see what I mean. So, I treated it as strands of it, wrapped around her, and gave her back the high collar, because I think it makes her look regal, and aristocratic. Anyway, that's the kind of thinking I applied, and tried to keep consistent, with the characters I worked on. Because several artists are rotating in to meet the double shipping, I won't be designing every character. Scot Eaton did some villains in the Rebirth special, and Phillipe Briones did some others, coming up later in the first arc. But we all bounce them back and forth and give ideas. That part is a lot of fun. TAS: What is your working process with colorist Gabe Eltaeb? Do you indicate where you’d like to see a certain shade or effect (page 6, behind Sark for instance) or do you leave that up to him? BW: We go back and forth a lot. And at the start, we discussed the look of the book, in great detail. I wanted a book that would really jump out at people and look welcoming. Get attention. I love the bright, optimistic color palette of Aquaman, historically, and I wanted to start there. 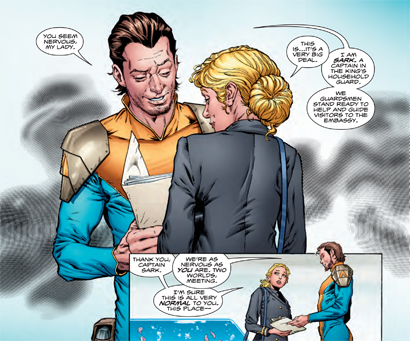 And the nice thing about that is, when the stories go dark, or sci fi/horror, you can really load up with shadows and make the palette much darker, and give a great contrast to the bright scenes like Aquaman and Mera on the lighthouse balcony, or them proudly introducing Spindrift Station. So, it helps you manipulate the way the reader is experiencing the story. And I think Gabe really locked onto that thinking and created a beautiful book that will pop on the stands by NOT being dark and murky and full of grays and browns. And I also have a close, symbiotic (ha!) working relationship with Andrew Hennessy on inks. He's the one that did the pattern behind Sark, on page 6 that you mentioned. I had drawn a hatching pattern, just to put some texture back there, and Drew messaged me and asked if he could play with it. I said sure. He does these really cool patterns that he makes in photoshop, and then prints out on an overlay or sticker, then cuts to fit the pattern, as I've drawn it. We did this all the time on our Green Lantern and Sinestro stuff, in the swirling space backgrounds. So, if you ever see me at a show, flip through my portfolios and run your hands over the pages. You can feel them. It's really cool. TAS: The final fight scene in Aquaman #1 features no panel borders between the action It stands out in contrast to the rest of the book. Is there a storytelling method behind this choice? BW: Yeah, I wanted the pace and the tension to escalate, visually. Dan asked for the art to be as "cinematic" as possible. In other words, to stack rectangular panels to mimic a film screen. Which isn't how my storytelling brain works, but I try to accommodate as much as possible. It was especially tricky on a script like this, where a lot of the pages were working to set up this huge, tall, visual marvel of an environment. So, if I needed to stack four panels on top of each other, the panels were all going to start to get thinner and thinner, and it feels like the roof is closing in. So, I fudged his request a bit, but tried to keep those early scenes pretty static still, with square and rectangular panels. Then, when the action starts and things are getting disorienting, I started turning the panels, to make things feel off kilter. So, by the end, when everything is chaos, and our main characters are fighting, I dropped them completely, and designed the pages like a montage of back and forth choreography between Arthur and Manta. And luckily, Gabe picked right up on it and tied it together. TAS: You’re drawing the stony scales of Aquaman’s costume full out, every panel. Is the Brad Walker who has to draw that every single time now mad at the Brad Walker who designed it? BW: Well, by the time half the fans were outraged by the look, I figured I owed it to them to at least not punk out on drawing it! Haha! Actually, part of my reasoning was, for me, this is faster/easier. The difficult thing about the classic scales is how uniform they are. If you screw up a row, or if it doesn't curve around the form right, it looks all kinds of messed up. These, you can't really mess up. Plus, I always felt like lots of people were cheating on the classic scales, anyway. They would only draw a few, and then fill it in with heavy shadows or highlights. I've got a pretty good system down now on the shirt, as I draw it, and it's kinda fun to do. Takes a few minutes, but I save it for the end of the page or panel. It's therapeutic. Hahaha! TAS: Do you have a favorite character to draw so far? 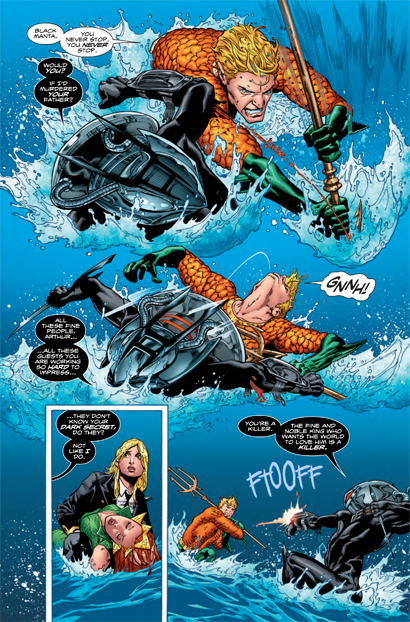 BW: So far, I'm still into Aquaman, the most. 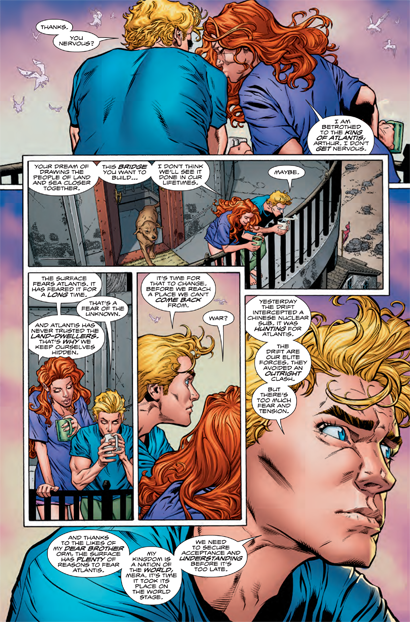 Though, Mera's hair is fun (so is Aquaman's, all the hair), and the two of them together is great. I'd been on Sinestro for a year or so, and it's been fun drawing heroes. People doing things they feel principled in doing. As odd as that may sound, it's a change, and it's enjoyable. TAS: Your Aquaman, while still being heroic and muscular of course, is a bit leaner than a lot of recent interpretations. It reminds me a little of how the great Jim Aparo drew the character, who tended to draw an Aquaman one would consider skinny. Was this a conscious approach? BW: Well, Aparo had a very Neal Adams-esque look to his work, and I've gotten comparisons to Adams too, so that doesn't seem that far fetched. But, like I mentioned, I don't really reference other artists while I draw, and certainly not ones from the series I'm working on. I try to look at life, and let the art be as authentic as I can. I'll pose for figure work and reference myself, and I'm leaner than some artists have drawn Aquaman, so maybe it has to do with that. Ha! But more than that, I think of most of the DC characters as a whole and try to give some visual diversity between them. For example, if I had Aquaman on panel with Superman or Batman, I would probably portray Aquaman a little leaner than either of them. Giving him a swimmer's build makes sense, to me. Without making him look skinny, hopefully. TAS: Aquaman and Mera have a lot of very distinctive facial reactions in the first issue. As any comic book fan knows, this is especially hard to pull off. Do you have models to help get it right? Often times that kind of thing came off looking very cartoony but I thought it was a highlight. BW: I definitely try to express the emotion I pick up in the scripts and have the characters "acting". I don't know that cartoony is the goal, or how I would describe it, but there's a fine line for me between realism and expressiveness, and I would prefer to lean into the expressiveness, even if it means sacrificing some realism. I don't like a static looking comic book. I'll model facial expressions in a mirror, or my laptop camera and try to adapt them to the features I've given the characters. It's tricky to do, since different features move and articulate differently, but that's one of the fun parts of drawing, to me. And I like when the way I draw a scene or a conversation gives the writer an idea, and they adapt the dialogue to it, after the art is finished. TAS: Any particular Aquaman villain you’re really itching to draw? BW: I think we're all itching to get to do something with Ocean Master. I'd love to get to use some others like Kordax (not sure if he even showed up in the New 52, since I fell off in my reading? ), and I'd love to draw and/or create some creature type villains. King Shark and that kind of thing. I love drawing animals, and animal people, so that's right up my alley. A big thanks to Brad and DC Comics for this interview. Check out Brad's work in Aquaman #1, on sale now! Nice read. 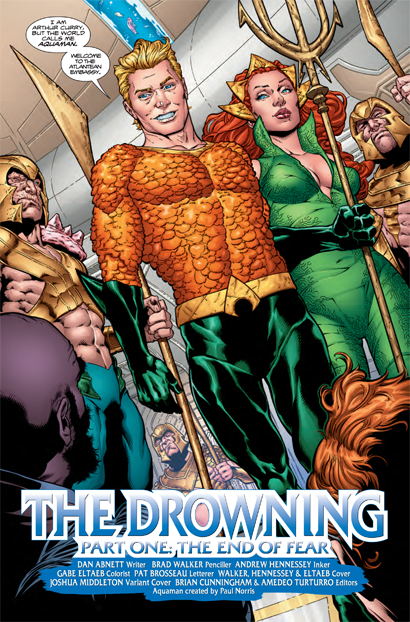 I wonder how Walker's redesign of Aquaman and Mera will affect Ivan Reis' work on Rise of the Seven Seas which reportedly began last fall before the Rebirth looks? Great interview! It was neat to hear his reasoning behind his interpretation of Aquaman's shirt, in particular. It's a unique take on the classic look, much like when Kevin Maguire fully rendered Captain America's scale male back in the early 90s. It eventually caught on with other artists. Basing it on smoothed stones is a nice touch. Sorry Im still a little mad with the moving of Amnesty Bay. It belongs in Maine.